Get lush echo and boost in one convenient pedal. 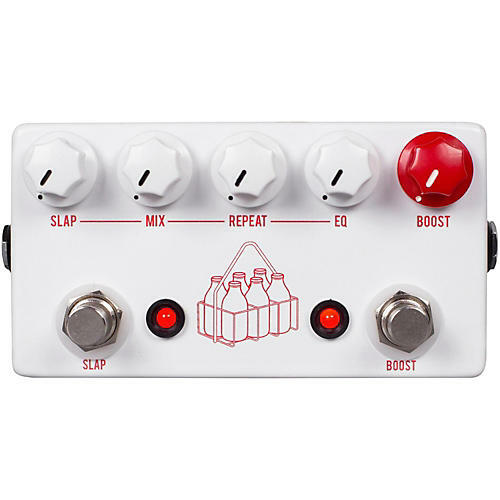 The Milkman is a collaborative idea between Josh Scott of JHS Pedals and Tim Marcus of Milkman Sound. The concept is simple; a single pedal that offers up an echo/slap delay and a boost that can be used as an always-on enhancer or as an overdrive for small-wattage amplifiers. Josh designed the circuit in late 2016 and here we are, a small footprint, easy to use boost/echo 2-in-1 that fits into any style players rig with ease. The left side of the pedal is the echo/slap delay circuit. This circuit is designed to be a hybrid of tape echo and analog BBD delay. The controls are simple and it sounds good in every setting. The “Slap” knob is the amount of delay time. As you turn the knob up, you will get longer delay times. Keep in mind, this pedal is designed for shorter vintage slap-back delay times. The “Mix” knob is the effect level. Full counter clockwise is all dry and full clockwise is full wet/effect. The “Repeat” knob controls how many echoes or repeats you get. The minimum is one and maximum is around 4.5 repeats. "Repeat" knob lets you fine tune how many delays you will get. Lastly is the “EQ” knob. This control only affects the repeat delay signal so that you can perfectly adjust the brightness or darkness of your echo. When fully counter clockwise the repeats are at their darkest much like an old BBD analog delay. When fully clockwise the repeats are the brightest they will be with more grit, this is much like a classic tape delay machine. The footswitching is a two-in-one arrangement, in which either effect can be used separately or together. The foot switch on the left, the switch will turn the delay on/off and the footswitch on the right will turn the boost on/off.